In the history of USA, seasonal hurricanes have taken and damaged more lives and property than any other type of natural disaster. Every year, from the beginning of June to the end of November, the coastal cities of US come under the threat of violent winds and floodwaters caused by hurricanes. 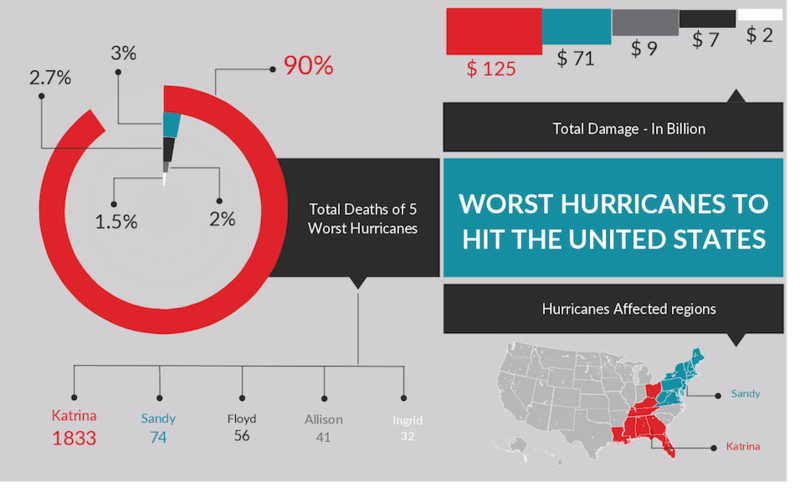 This infographic rounds up facts on the worst hurricanes to hit the United States over the past few years. Katrina – Hurricane Katrina is regarded as one of the deadliest hurricanes to ever hit the US. It mainly affected the Gulf Coast and New Orleans and killed an estimated number of 1833 people in late August in 2005. Sandy – Hurricane Sandy killed dozens of people and left thousands homeless and millions without power when it hit the East Coast of USA in late October in 2012. Floyd – Hurricane Floyd which affected North Carolina in early September in 1999, is a Cape Verde type hurricane. It killed 56 people and caused nearly $9 billion worth of damage. Allison – June 2001 marked the occurrence of hurricane Allison, another one of the worst hurricanes to hit USA, in southeast Texas. It came with torrential rains and flooding that killed 41 people. Ingrid – Hurricane Ingrid affected the Gulf of Mexico in September, 2013. It led to the deaths of more than 30 people due to mudslides and flash flooding caused by heavy rainfall.